Congress stuck taxpayers with this bill when it cooked up a layer cake of additional farm income subsidies in the 2014 Farm Bill on top of the heavily subsidized federal crop insurance program. That program already paid farmers billions of dollars each year if revenue from the sale of crops fell below what they expected to earn when they planted. Payouts from the newly added programs – Agricultural Risk Coverage, or ARC, and Price Loss Coverage, or PLC – are triggered if crop yields or prices are lower than expected. The fine line between the old revenue-based insurance program and the new yield- and price-based programs can be confounding to anyone unschooled in the arcane provisions of federal farm policy. But it underscores the fact all three programs essentially pay subsidies for exactly the same reasons. 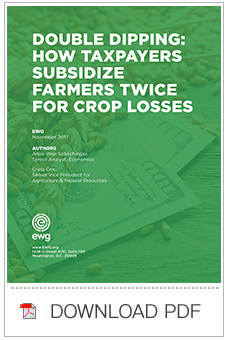 As Congress begins debate on the next farm bill, expected to be passed next year, USDA subsidy data show that double-dipping is an indefensible scheme: It not only fleeces taxpayers, but also fails to address the real economic and environmental problems plaguing farm country. For the 2014 and 2015 growing seasons, the ARC program paid out $10.4 billion and the PLC program paid out $2.7 billion. In the same years, the revenue-based crop insurance program paid out $10.7 billion for the same crops that received ARC and PLC payments. Farmers cover some of the cost of the insurance program through the premiums they pay for their policies, but the government pays more than 60 percent of the premiums. The USDA’s contracts with the private, for-profit companies that sell and service the policies are written to ensure that taxpayer money covers most of the losses in revenue. Those losses, of course, are incurred when bad weather hurts yields or economic conditions reduce prices – the same conditions covered by ARC or PLC. Farmers have to choose to participate in either ARC or PLC. They must also choose between two options under ARC: One option pays when an individual farm’s revenue drops below a set revenue guarantee, while payouts from the other option are based on average crop yields and prices for all farms in the county. PLC payouts are triggered if the crop price drops below a floor called the reference price, set by Congress in the farm bill. But farmers can – and hundreds of thousands do – participate in either ARC or PLC and in the crop insurance program. Most of the double dipping in the 2014 and 2015 growing seasons came from duplication of crop insurance and ARC payouts. You don’t need a degree in agricultural economics to see the result: multiple payments going to the same farmers in the same counties to cover the same “drop” in revenue from crop sales. The interactive map below shows the counties where farmers received duplicate payments from at least two of the three programs. In 2015, more than 2,300 counties received an ARC or PLC payment for losses incurred in 2014. Crop insurance policies paid out in more than three-fourths of those counties in 2014. The pattern was repeated the following year. Crop insurance payouts went to 71 percent of the more than 2,800 counties that got ARC or PLC payments for losses incurred in 2015. Among the biggest winners were Kossuth County, Iowa; Whitman County, Wash.; and Renville County, Minn. Those three counties alone received over $140.3 million in ARC payments and $158.2 million in crop insurance payments. The average county among those that received duplicate payouts took in $4.6 million in ARC, PLC and crop insurance payments for 2014 losses. The chart below shows that 28 states accounted for 98 percent of all ARC, PLC and crop insurance payouts. The top six states accounted for over half of all payments from the three programs. All were in the Midwest – Iowa, Minnesota, Nebraska, Illinois, Kansas and North Dakota, which together received over $12.3 billion. In those states, ARC paid $6.1 billion, crop insurance payments were almost $5.9 billion and PLC payments were $333.5 million. In the 2014 Farm Bill, Congress finally eliminated the direct payment program, which subsidized select commodity crops, but swapped in ARC and PLC. The shift was touted as a big money-saver, but the expected savings disappeared almost before the ink was dry on the new law. ARC and PLC payments for 2014 and 2015 were higher than any year of direct payments between 2008 and 2013. The Congressional Budget Office projects that between 2016 and 2021, ARC and PLC payments are projected in only one year to be less than the annual amount of direct payments that were paid out between 2009 and 2013. Double-dipping is just one of the flaws that have made federal farm policy inequitable and ineffective. Congress continues to enact farm bills that ignore how dramatically conditions have changed in farm country. Although total farm income is falling, median income in farm households is growing. Median household income for farm families grew from $68,680 in 2012 to a projected $76,831 in 2017. Like most American families, in farm families both spouses need to work to make ends meet, and an off-farm job often produces far more income than a farm job. In 2015, farm households earned a median income of $76,735. That’s $20,000 more than the $56,516 median income for all U.S. households that year. Fewer than one-tenth of all farms depend on sales of crops and livestock for most or all of their household income. In 2015, median household income for midsize farms that met this criteria was $170,000. For large farms it was $340,000, and for very large farms more than $1.1 million. Rural America doesn’t depend much on farming anymore. According to the USDA, in 2014, farming generated only 6 percent of all jobs in non-metro areas. It’s fair to ask taxpayers to help out farm households that are truly suffering as prices and income levels drop. But that’s not who gets farm subsidies or big crop insurance payouts. Between 1995 and 2016, the top 10 percent of farm subsidy recipients received 77 percent of all crop subsidies. The smaller family farms that rely on farm income and are likely in trouble today get the crumbs. The real problems in farm country today must be addressed by fundamental reform of the broken subsidy system, not more of the same failed policies. Congress should target subsidies to farm families who depend on farm income and need help now to keep their businesses afloat. Currently, an individual making up to $900,000 a year in adjusted gross income, or $1.8 million for a couple, can still get farm subsidies. On top of that, you don’t actually have to get your hands dirty on the farm to get the check. Sensible reform would save taxpayers billions of dollars and do more to help out struggling family farms. The savings could be redirected to programs that protect our drinking water or put food on the tables of struggling families. [*] ARC and PLC payments are made the year after the subsidized crop was grown. The $13 billion in payments discussed here were made in 2015 and 2016 to cover losses during the 2014 and 2015 growing seasons.